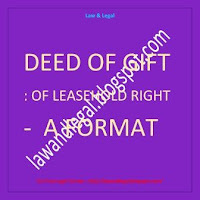 Here is a format of Gift Deed, gift of leasehold rights in a property. A PDF version of the format can also be downloaded from the link provided below. A person has taken a residential property on lease for 99 years from the owner thereof and thus has acquired leasehold rights on the said property. Now he intends to gift the same to his near and dear one. However, it is to be kept in mind that as the person has only the leasehold rights over the said property he can gift the same only, but the property remains with the owner only. 3.1 __(name of the donor)__, son/daughter/wife of _________, by Nationality – Indian, by faith ________, by occupation – _______, resident of ___________ (address with Police Station)___________. 3.2 __(name of the donee)__, son/daughter/wife of _________, by Nationality – Indian, by faith ________, by occupation – _______, resident of ___________ (address with Police Station)___________. 4.1 ______(name of the society)_________, a Registered Society under the provisions of the Societies Act, 1961, having its office at ____________________ (Head Lessor) is the owner of a Building Complex lying and situate at _______________________________ (Said Complex). 4.2 By virtue of a Deed of Lease dated ________ duly registered at the office of the _________ in Book No. I, Volume No. ____, Pages from ______ to ______, being No. ____ for the year ____ (Head Lease) and made between the Head Lessor [as the Lessor of the First Part therein] and the Donor [as the Lessee of the Second Part therein], ALL THAT a residential flat _____ (short description of the flat)_____, more fully described in the Schedule below (Subject Property) was demised/leased to the said Lessee therein (the Donor herein) for the term of 99 ninety nine years with effect from ______ in consideration of the quarterly rent of __________ only and subject to the Lessee’s covenants and the conditions in the said Head Lease reserved and contained. 4.3 Thus the Donor herein (being the Lessee in the Head Lease) acquired the leasehold right and interest in the Subject Property, described in the Schedule below. The Donor is entitled to give the Subject Property on Sub-Lease or sub-let, assign or transfer the lease granted by the Head Lease. 5.1 Relation of the Parties: The Donee is the __(state the relation)__ of the Donor and the Donor bears natural love and affection for the Donee. 5.2 Desire to Gift & Acceptance: The Donor has expressed his desire of gifting the Subject Property in favour of the Donee and the Donee has agreed to accept such gift. 5.3 Acceptance of Terms: The Donee has fully acquainted himself with the terms and conditions of the said Head Lease and has undertaken to abide by all the terms and conditions contained therein as applicable and the parties thereto have mutually agreed that terms and conditions as regards the obligations, liabilities and accountability of and on the part of the Lessee in the Head Lease shall be deemed to have been incorporated herein unless specifically provided herein otherwise and shall be considered to be obligations, liabilities and accountability of the Donee herein. 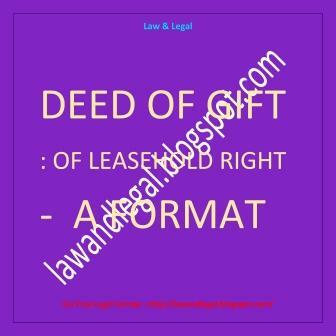 6.1 Hereby Made: The Donor as the beneficial owner doth hereby gift, convey, transfer and assign to the Donee, absolutely and forever, the Subject Property, being ALL THAT leasehold right and interest in the Subject Property, described in the Schedule below, as recited in the Head Lease To Hold for the residue of the term granted in the Head Leases and for such further period as provided therein. 6.2 Consideration: Natural love and affection that the Donor bears for the Donee. 6.3 Subject to: The Gift hereby made is subject to the payment by the Donee of the quarterly rents and other payables, if any, as reserved in the said Head Lease and also subject to the covenants and conditions contained therein and on the part of the Lessee (the Donor herein) to be observed and performed. 7.1.1 Gift: A gift within the meaning of the Transfer of Property Act, 1882. 7.1.2 Absolute: Absolute, irreversible and forever. 7.1.3 Free from Encumbrances: Free from all encumbrances of any and every nature whatsoever save and except the terms and conditions as reserved and contained in the Head Lease. 8.1 Holding Possession: The Donor hereby covenants that To Hold as to the leasehold rights and interests in the Subject Property unto the Donee for the residue of the term granted under the Head Lease, subject to the rent reserved therein without any lawful eviction, hindrance, interruption, disturbance, claim or demand whatsoever from or by the Donor or any persons lawfully or equitably claiming any right therein from under or in trust from the Donor. 8.2 Donee’s Covenants: The Donee hereby covenants with the Donor that the Donor or any person(s) deriving title under him, will henceforth from time to time duly pay all proportionate rent as aforesaid becoming due under the Head Lease and observe and perform all the covenants and conditions therein contained and henceforth on the Lessee’s (the Donor herein) part to be observed or performed, and also shall at all times hereafter save harmless and keep indemnified the Donor and his estates and effects from and against all proceedings, costs, claims and expenses on account of any omission to pay the said rent or any breach of any of the said covenants and conditions. 9.2 Headings: The headings in this Deed are inserted for convenience only and shall be ignored in construing the provisions of this Deed. 9.3 Definitions: Words and phrases have been defined in the Deed by bold print and by putting them within brackets. Where a word or phrase is defined, other parts of speech or grammatical forms of that word or phrase shall have corresponding meaning. 10.1 In Witness Whereof the Donor has executed and delivered this Deed of Gift on the day, month and year mentioned above. The person wants to gift the leased property. The Right of ownership will remain with the actual owner of the property. The format is good. This Format of Gift Dead is very comprehensive Especially Actuall ownership of the property will be retained by actual owner of the property!